This product has been replaced by Unitech MS246. 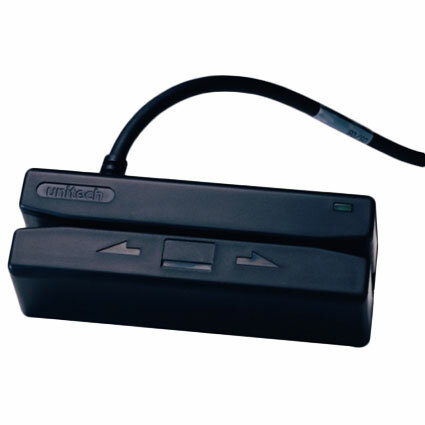 The Unitech MS240 card reader offers an easy to use solution for businesses needing to capture credit cards, employee access cards, or any other magnetically encoded card data. The small and affordable reader provides the ease of use and ease of programming ideal for a variety of applications. At less than 4" long, the MS240 mounts easily to monitors, keyboards, or counters without taking up much space. The 3-track reader in the MS240 provides accurate reads every time, and can survive over 1,000,000 card swipes. With a 1-year warranty standard, the Unitech MS240 card reader is a long lasting and economical addition to any business. Dimensions (W x D x H): 1.38" x 3.94" x 1.18"